High Strength InterLocked Over Braided Liquid Tight Conduit is most suitable for industry machines wirings demanding high mechanical strength with high abrasion and hot metal swarfs resistance. 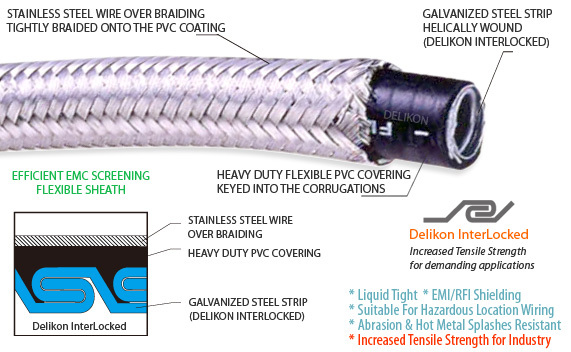 Delikon EMI shielding Heavy Series Over Braided Interlocked Liquid Tight Metal Conduit protects industry automation and control cables. *Galvanized steel helically wound (interlocked) with PVC coating and wire over-braid. 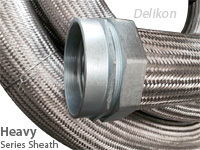 Delikon, experts in the manufacture of heavy series over braided flexible conduit and fittings for industry automation power and data cables protection. 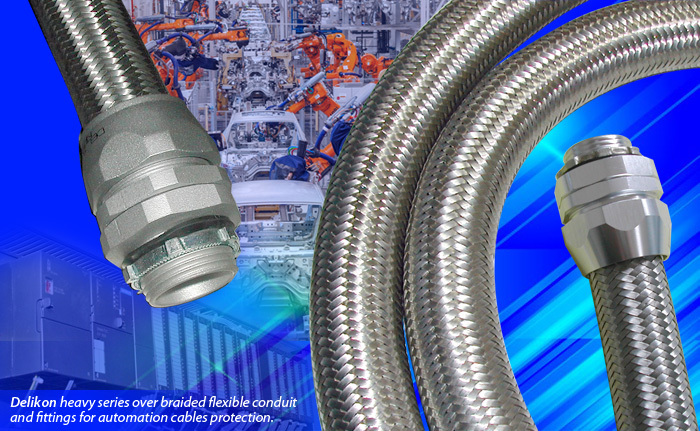 Our flexible conduit systems offer reliable cable protection solutions for PLC, sensors, machining centers, industry robots and other demanding industrial applications. This Flexible Metal Conduit is suitable for use in Hazardous Locations; Industrial environments where higher abrasion resistance or screening are required. Liquid tight flexible Metal conduit without wire over-braid. Suitable for machines. 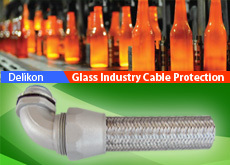 Over Braided Flexible Metal Conduit offers excellent protection to cables against hot metal splash in steel mills. For steel mill retrofit. Stainless steel braid provides extra protection. This interlocked over braided liquid tight conduit is highly resistant to wear, abrasion and electric sparks or hot metal splashes. This conduit is also resistant to common oils and grease in industry environments and has good flexibility and good mechanical resistance. Interlocked over braided liquid tight conduit also offers good protection against electromagnetic interference across a large wave band. Download the catalog page for DELIKON SM-701 Over Braided Interlocked Liquid Tight Conduit in PDF File format. Or have a look at other models of over braided flexible conduit and braided conduit fittings. *All sizes and dimensions listed above are subject to manufacturing tolerances. Delikon Heavy Series Over Braided Flexible Metal Conduit is widely used to counter mechanical stress and is flexible, and it is resistant against tensile stresses as well as transverse pressure. The stainless steel wire braiding covering of this heavy series conduit also offers excellent protection to cables against hot metal particles, sparks, slag, and immunity from electromagnetic interference. 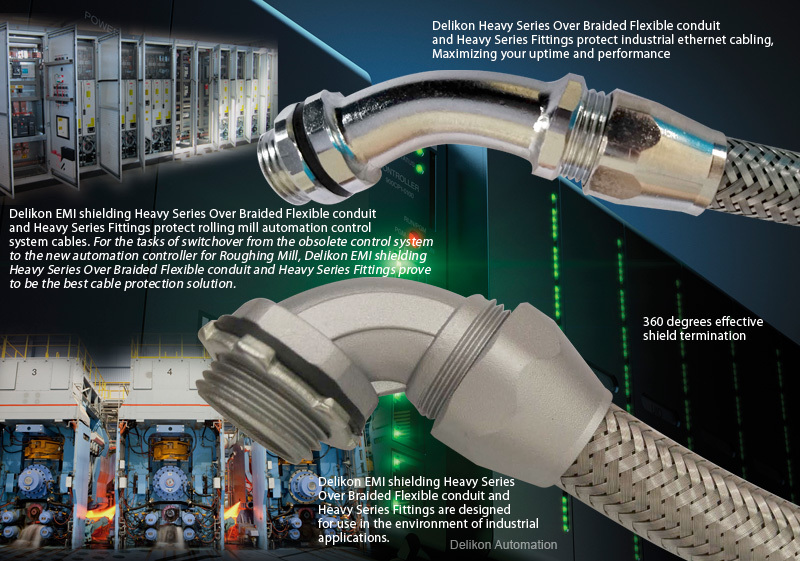 Together with the heavy series connector, Delikon Heavy Series Over Braided Flexible Metal Conduit provides reliable protection to IT and Automation Systems Cables in the Metal and Petrochemical Industry.